President of European Council on International Relations Professor Dr. Anton Caragea was the first world leader to offer his congratulations to H.E. Academician Hun Sen, Prime Minister of Cambodia after the landslide victory that confirmed him to retain premiership for another five years. Prime Minister Abdoulkader Kamil Mohamed on Thursday raised Professor Anton Caragea, President of the European Council of International Relations, to the rank of Commander in the National Order of 27 June. The decoration was destined to mark the nation`s gratitude for the global exertions of President Dr. Anton Caragea in supporting the principles of: independence of states, non-interference in the internal affairs of other nations, respect for national sovereignty and territorial integrity, rejection of external interferences, diplomacy based on the principles of equality among all states, of cooperation, of mutual beneficial cooperation, rejection of threats and of use of force in the international relations. All these are the main pillars of the vision of President Dr. Anton Caragea on the international relations in XXI century that are guaranteeing for all nations, small or big the same rights and liberties and respect on international arena. The Prime Minister raises Professor Dr. Anton Caragea to the rank of Commander in the National Order of June 27. 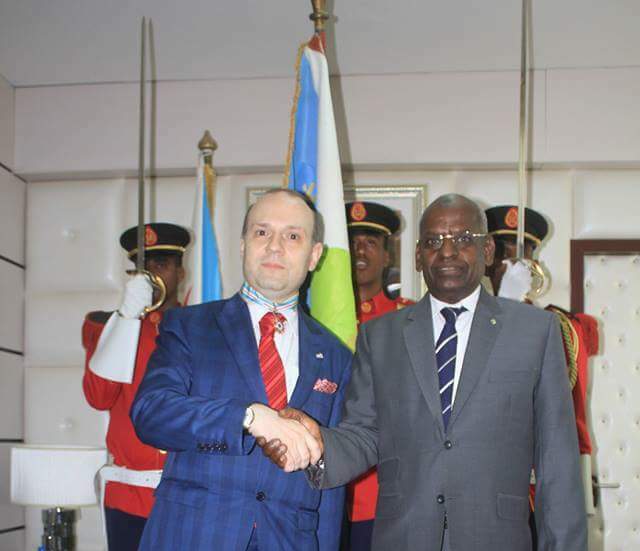 On April 10, the recipient President of the European Council of International Relations was in official visit in the Republic of Djibouti. 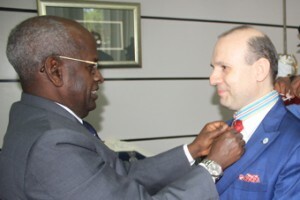 On this occasion, the Prime Minister thanked Professor Anton Caragea on behalf of the Republic of Djibouti for the award of this award and the recognition of the efforts of the Head of State, Ismaïl Omar Guelleh, and his government for the promotion and development of the cultural, diplomatic and tourism potential and assets of our country. The decoration ceremony was attended by the Minister of Culture, Moumin Hassan Barreh, the Minister Delegate for Trade and Tourism, Hassan Houmed Ibrahim, the Secretary General of the Presidency, Mohamed Abdillahi Waïs, the Chief of Cabinet of the Presidency, Mohamed Abdoulkader Ibrahim, the Director General of the National Tourist Office, Osman Abdi Mohamed, and high level delegates of the European Council of International Relation. August 15 - Cambodian People's Party, ruling party of Cambodia led by Prime Minister Hun Sen, triumphed overwhelmingly in late general election 2018 held on 29 July 2018, taking all the 125 seats in the National Assembly, National Election Committee announced Wednesday. In the official results of July's elections, the NEC said the CPP won 4,889,113 votes of the total 6,362,241 valid votes. H.E. Academician Hun Sen, Prime Minister of Kingdom of Cambodia has received at the Peace Palace the delegation of Heads of International Elections Monitoring Missions to Cambodia 2018 Election. The International and National Elections Monitoring teams comprised around 160.000 electors guaranteeing the free and fair 2018 Cambodian Elections. The pre-election period and campaign was characterized by a free and open legislation, encompassing all the necessary legal and constitutional procedures granting any Cambodian society member the right to partake on the election, to present and promote his candidature and to have the opportunity to express his views and vote. The campaign climate was peaceful, open with no pressures upon the voters, with anti-money laundry provision ensuring an equal opportunity climate for all the candidates. The Election Day activities were conducted in a transparent manner, without pressure or state authorities’ intervention in a manner conducive to allowing the free expression of the Cambodian people. We observed the process of opening the ballot boxes, casting vote, closing stations, and counting the ballots. We observed that the Cambodian voters seem to be enthusiastic to participate in the voting. The voters showed good conduct and discipline during the process,” stated Aminath Eenas, President, Human Rights Commission of Maldives. The world recognized your legitimate victory declares President professor Dr. Anton Caragea to academician Hun Sen, Prime Minister of the Kingdom of Cambodia while handing him the international community assessment for Cambodia`s July 29 elections. We appreciate that: the vote of 29 July 2018 has expressed in a democratic manner the views and the decision of Cambodian people and the electoral process was clearly transparent, open, all-inclusive and genuine democratic in nature and organization. As President of Columbia, Mr. Andrea Pastrana, himself an international observer in this elections had declared to the media after the meeting: the full legitimacy can be ascribed to Cambodia`s elections. Cambodia has passed to a full democratic status and legitimacy and international recognition after the well organized and free, transparent polls of July 29, 2018, endorsed by more than 500 rights groups across the world and appreciated by the global democratic community. The elections for National Assembly of Kingdom of Cambodia are marking a new achievement with the registration of more than 160.000 electoral monitors for the upcoming elections branded by the Government as an example in history and by international community as free and fair in preparations. The National Election Committee (NEC) of Kingdom of Cambodia increased the estimate from a previous figure of about 80,000, saying the observers were fairly evenly split between civil society groups and political party observers. The National Election Committee (NEC) increased the estimate from a previous figure of about 80,000, saying the observers were fairly evenly split between civil society groups and political party observers. Some 107 organizations will send observers to polling stations, according to a statement released by the NCE on Wednesday. The Government of Prime Minister Hun Sen is credited with organizing what government assses to be the best elections in the nation`s history. The international community is congratulating the government of Cambodia for the exemplary development of democracy in the country during the twenty-five years since the Constitution of Cambodia enshrined liberal multi-party democracy. As we near the elections scheduled for 29 July this year, we appreciate the full progress of civil and political rights in Cambodia and the commitment for the conduct of credible, free and fair elections in July. The peaceful climate after the dissolution of the terrorist organizations that where plaguing the nation and the fact that rights to freedom of expression, press, association and peaceful assembly, are respected, protected and fulfilled are encouraging. It is clearly that Cambodia is registered on a path of development, full commitment to human rights and in full adherence to a genuine liberal multi-party democracy as envisaged in the Constitution of Cambodia for the benefit of all Cambodians. The preparations for July 29 elections where saluted world-wide as conducive to a free and fair expression of the will of the Cambodian people and as a living democratic exercise and we hope that the election day, tabulation, collation and announcing of the results will be conduced in the same transparent manner. European Council on International Relations-EUCIR parliamentary team of observers for the Cambodian elections, scheduled for July 29, began working. The mission is part of a global effort of monitoring by World Election Monitors Organization (WEMO) and is appreciated, according to NATIONAL ELECTION COMMITTEE OF CAMBODIA statements that 50.000 national and international observers will be taken part. The global mission started his activities on July4th with a press conference and an exposé of targets and objectives. Professor Dr. Anton Caragea, Head of International Observers Team for Cambodia 2018 Elections, launched the mission at a press conference on 4 July, stressing the importance of Cambodia’s parliamentary elections for the country’s stability. On this occasion the official launch of the website of Election Observation Mission for Cambodia has taken place. Professor Dr. Anton Caragea explained all that World Elections Monitors Organization (WEMO) Observation Missions use a common methodology underpinned by the principles of impartiality, objectivity, independence and non-interference. ‘’International Election Observation Missions are responsible for their own conclusions and do not receive instructions neither from the European institutions nor by member states’ governments.’’. The Head of International Observers Team detailed the long-term monitoring methodology. The election observation mission for the Kingdom of Cambodia 2018 will cover the political campaign, pre-election preparations, election day – polling, counting and tabulation of results – and the complaints and appeals process as well as the announcement of results. This will include a thorough analysis of the legal framework, the work of the election administration, campaign activities, the conduct of the media in covering the elections, and the mechanisms for electoral disputes. The mission will meet election stakeholders, including government officials, election administration bodies, candidates and representatives from political parties, members of civil society and the media, the judiciary, amongst others. Shortly after election day, the mission will issue a statement containing its preliminary findings. A final report, including a comprehensive assessment of all aspects of the electoral process and with possible recommendations for future elections, will be released several weeks later announced Professor Dr. Anton Caragea. Elections observers pose for a photo with the Head of International Electoral Observation Team- President Dr. Anton Caragea. How do you make an observation mission? Election observation gives the opportunity to assess an electoral process according to international standards. The members of World Electors Monitors Organization (WEMO) are leading global actors in providing technical electoral assistance complementary to election observation. This dual form of election support constitutes a significant contribution to the promotion of governance and development objectives. What is an observation mission? An observation mission assesses all aspects of the electoral process, its constitutional and legal framework, the delimitation of constituencies, the registration of voters and candidates, the training of election staff, voter education, media coverage, the campaign and the preparations for election day, as well as the appeals process. On election day, observers visit pooling stations in order to observe the opening, voting, counting and aggregation of results. What are the principles of an electoral monitoring mission? Its fundamental principles are full coverage, impartiality, transparency and professionalism. Its ultimate objective is to become superfluous by entrenching democracy deep within each nation through the development of national capacities. Its main goals are the legitimization of an electoral process, where appropriate, and the enhancement of public confidence in the electoral process to deter fraud, to strengthen respect for human rights, and to contribute to conflict resolution. Members of an Election Observation Mission undertake a range of activities, including monitoring the media and election campaigns, reviewing the election law, the constitution and commitments the country is signed on to, in detail. They also examine the election machinery from polling clerks to the administrator as well as observe training. The team generally attempts to meet all the key stakeholders and party political activists. They attend party rallies, meet candidates, civil society organisations, academics, etc.. The observer team usually holds press conferences at the start and end of their visits, and at the end of the mission, the team prepares a report that is available to the public. The statement said electoral observations should be conducted with integrity and transparency, and electoral observers should perform their tasks without any interference. It said the observers should not interfere in internal affairs of Cambodia, and should not talk with voter registration applicants or voters in term of supporting or opposing any political party or candidate. Also, the observers should not conduct any survey for any political party or candidate, and should not provide a written statement or interview to media in the form of supporting any political party or candidate. The code of conduct also banned observers from disturbing the process of voter registration, voting and ballot counting. Under the Law on the Election of Members of the National Assembly, the violator will be fined between 2,500 U.S. dollars and 5,000 U.S. dollars by the NEC, the statement said. According to the statement, after the election process is completed, the electoral observers should submit a written report on their observation and conclusion on election process to the NEC. The Southeast Asian nation is scheduled to hold a national election for the 125-seat parliament on July 29, 2018 and some 8.3 million Cambodians are eligible to cast their ballots. The NEC had officially recognized 20 out of the 20 political parties that registered to contest in the election, according to another NEC statement. Among the recognized political parties are the ruling Cambodian People’s Party (CPP) of Prime Minister Samdech Techo Hun Sen, the royalist Funcinpec Party of Prince Norodom Ranariddh, and the Grassroots Democracy Party. The three-week electoral campaign will start from July 7 to 27. Prime Minister Hun Sen on Monday called on the authorities to freely allow political party leaders to meet their activists or supporters at different places across the kingdom. “It will not be a free contest if we prevent the leaders of political parties from visiting various places to meet their members or supporters,” the prime minister said during a groundbreaking ceremony for a road construction in Kampong Chhnang province. According to international observers, Cambodian People’s Party (CPP) of Academician Hun Sen is tipped to win the elections by a huge margins driven forward in the electoral preferences by the country steady economic growth, strong democracy and peoples centered policies implemented by the Academician Hun Sen during his tenure as the Prime Minister of the Kingdom. Peoples are crediting him for the country’s hard-earned peace and development. 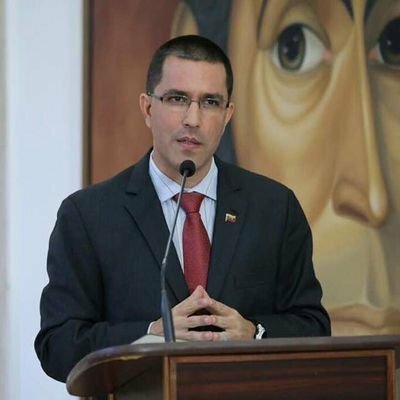 Jorge Arreaza Montserrat, The Minister of Foreign Affairs of Venezuela succeeded in fruition of President Maduro vision to carve out a powerful message: WE ARE ALL VENEZUELA! Caracas will become the official world diplomatic capital on the occasion of The International Day of Peace, Sovereignty and Bolivarian Diplomacy proclaimed by President Nicolas Maduro of Venezuela. President Nicolas Maduro appeal for The International Day of Peace, Sovereignty and Bolivarian Diplomacy united the world in a Caracas lead global movement for peace and democracy. The International Day of Peace, Sovereignty and Bolivarian Diplomacy is the brainchild of President Nicolas Maduro, part of the generally acclaimed Bolivarian diplomacy efforts that are destined to carve out a diplomacy for the people, oriented toward cooperation without confrontation, independence without encroachment and dialogue for peace. In accordance with Caracas role as a global and multipolar diplomatic rostrum ,The International Day of Peace, Sovereignty and Bolivarian Diplomacy –Solidarity with Venezuela is attended by leaders around the world interested in crafting the agenda for a XXI century without aggression, imperialist ploys, menaces and conflicts. EUCIR President Professor Dr. Anton Caragea, will outline his vision on world summit in Caracas (16-17 September 2017). Europe will participate fully on the event with a delegation led by President-Professor Dr. Anton Caragea in attendance. As the Minister of People Power for International Relations I consider with interest your participation in this space of magnitude importance and your solidarity in this historical moment when we celebrated the legacy of dignity and justice of Comandante Hugo Chavez and of President Nicolas Maduro bequeathed to the Venezuelan people and to the Bolivarian revolution. Before the departure to Venezuela the European Council on International Relations President Anton Caragea outlined his vision in relation with the most significant diplomatic meeting of 2017. Our presence on the diplomatic and world solidarity event with Bolivarian Revolution of Venezuela is carved as a powerful symbol of our commitment with the fight for freedom, dignity and sovereignty of Venezuelan people under the peerless leadership of Bolivarian government and the selfless dedication of President Maduro. Freedom will prevail! this is the powerful truth that people of Venezuela and President Maduro are presenting to the world gathered in Caracas. In the world of today Venezuela has become a vibrant example of participatory democracy, prominent exertions for Latin America and global independence and respect for the statehood and national independence, stated President Dr. Anton Caragea. Caracas is playing host to a giant manifestation of vitality of democracy loving personalities all united under one cry destined to be heard worldwide: Freedom will prevail! La presidencia de Nicolás Maduro a impulso una Venezuela que se ha convertido en uno de los líderes del mundo democrático. El presidente Nicolás Maduro acaba de regresar a Caracas tras una gira por Kazajstán, Argelia, Oriente Medio (con reuniones con dirigentes de Turquía, Irán, Kazajstán, Rusia y Argelia) y del 16 al 17 de septiembre de 2017 acogerá la CONFERENCIA MUNDIAL: TODOS SOMOS VENEZUELA. DIÁLOGO POR LA PAZ, LA SOBERANÍA Y LA DEMOCRACIA BOLIVARIANA. La capital venezolana-Caracas acogerá a los líderes interesados en el diálogo y los valores democráticos mundiales en un diálogo global. En menos de una semana el líder de la revolución bolivariana ha logrado vincular Venezuela con los principales países exportadores de gasolina, logró crear un puente de amistad entre América Latina y Asia Central y será anfitrión de líderes mundiales y jefes de movimiento democráticos que no sólo expresarán apoyo a Venezuela, sino también uso este tiempo para promulgar la diplomacia bolivariana, el concepto esculpido y puesto en primer plano por el presidente venezolano. La convocatoria a la CONFERENCIA MUNDIAL: TODOS SOMOS VENEZUELA. DIÁLOGO POR LA PAZ, LA SOBERANÍA Y LA DEMOCRACIA BOLIVARIA! es la descripción más completa y exhaustiva de los principales objetivos de la diplomacia bolivariana y debe ser considerada como un punto crucial en el desarrollo de un mundo multipolar, un mundo de democracia y paz. Nosotros, ciudadanos del mundo, trabajadores, miembros de movimientos sociales, organizaciones de derechos civiles, partidos políticos, académicos, intelectuales y creadores, denunciamos ante la humanidad la conspiración internacional encabezada por el Gobierno de Donald Trump contra el pueblo de la República Bolivariana de Venezuela, su Gobierno y sus legítimas autoridades. Al amparo un discurso de supremacía racial, intolerancia y guerrerismo que rememora los más oscuros tiempos del fascismo, el Gobierno de Donald Trump, ejecuta una agresión política, diplomática, económica y mediática, incluyendo la opción militar, para desestabilizar la democracia venezolana, derrocar al Presidente Nicolás Maduro, e instaurar un Gobierno sometido a los intereses de Washington. El proyecto de restauración neocolonial en Venezuela pretende despojar al pueblo venezolano de su soberanía y devolver a los poderes globales el control sobre las inmensas riquezas y recursos del país. Esta conspiración contra un país soberano, abiertamente violatoria del derecho internacional, avanza con el masivo apoyo de las grandes transnacionales de la información, y el vergonzoso respaldo de gobiernos neoliberales y antipopulares. Desde abril pasado, con financiamiento y apoyo estadounidense – a través de la oposición venezolana- se inició una campaña de violencia política presentada al mundo como protestas civiles y pacíficas. A esta campaña de desinformación se sumó la descalificación mediática de la democracia venezolana ante la opinión pública mundial presentando a Venezuela como una dictadura que viola los derechos humanos y que ha hundido al país en una supuesta crisis humanitaria. La verdad es que la única intención de esta campaña es derrocar al Gobierno legítimo de Venezuela mediante la propagación de la muerte, el caos y la violencia, al estilo de las llamadas “Revoluciones de Colores”. Desde entonces, más de cien personas han fallecido y más de dos mil resultaron heridas. La violencia política impulsada por Washington ha generado cuantiosos daños materiales y sufrimientos al pueblo venezolano. La más reciente manifestación de este complot es la desacreditación del proceso electoral llevado a cabo el 30 de julio, en el que más de ocho millones de venezolanos eligieron una Asamblea Nacional Constituyente. Con la elección de la Asamblea Nacional Constituyente, el pueblo venezolano derrotó la violencia en las calles y ha recuperado la paz. Desde el 30 de julio ha comenzado un proceso de normalización de la vida civil y política, mediante la participación de todos los partidos políticos en las próximas elecciones de Gobernadores, convocadas para octubre. Con la reciente amenaza del uso de la fuerza militar emitida por Donald Trump, y la imposición de un bloqueo financiero a Venezuela, el Gobierno supremacista de Washington ha escalado el conflicto, declarando abiertamente la intención de “ahogar” la economía venezolana. Repudiamos la peligrosa escalada de agresiones contra Venezuela por parte de la administración estadounidense. Venezuela es una nación que desde hace 18 años construye pacíficamente una democracia popular. La democracia bolivariana devolvió al país el control sobre los recursos naturales, ha redistribuido la riqueza en favor de los trabajadores y de los sectores humildes, y ha garantizado los derechos sociales para todos sus habitantes. El Presidente Nicolas Maduro es acogido en todo el mundo como un mensajero de la paz, democracia y diálogo. Los logros sociales de Venezuela en educación, salud, protección social, universalización de la seguridad social y derechos de las comunidades originarias, demuestran que es posible hacer más democrática la democracia. Su visión ecosocialista desafía a quienes imponen el saqueo de los bienes comunes de la humanidad por parte de las élites transnacionales. Venezuela no es una amenaza para ningún país del mundo. Desde su independencia, hace más de 200 años, nunca ha mantenido un conflicto militar, ni ha participado en guerras o agresiones contra otras naciones. Para los amantes de la paz, y para los pueblos del mundo, Venezuela es un faro de esperanza. Esa esperanza está hoy amenazada por la ideología supremacista instalada Washington. La decisión de la élite gobernante de EEUU es bloquear el diálogo político diálogo en Venezuela y lanzar al país a un conflicto fratricida para justificar así sus planes de intervención. Alertamos al mundo sobre la grave amenaza para la paz mundial derivada de la obsesión guerrerista de Donald Trump. Una agresión militar a Venezuela, o el derrocamiento de la Revolución Bolivariana, provocará en el hemisferio una crisis de dimensiones históricas en todos los órdenes y quebrará el esfuerzo integracionista, echando por tierra el objetivo de todas las naciones de la región, que han declarado a América Latina y el Caribe una zona de paz. El mundo debe detener la locura de Washington. En nombre de la humanidad, exigimos a Donald Trump que retire la amenaza de agresión militar y derogue las sanciones económicas y el bloqueo financiero contra el pueblo venezolano. Por todas estas razones, convocamos a los hombres y mujeres de bien, de todos lugares, ideologías y creencias, a los que sueñan un mundo de justicia e igualdad, a sumarse a la JORNADA MUNDIAL TODOS SOMOS VENEZUELA. DIÁLOGO POR LA PAZ, LA SOBERANÍA Y LA DEMOCRACIA BOLIVARIANA a realizarse en Caracas, Venezuela, el 16 y 17 de septiembre, y a partir de esa fecha, en diversos lugares del mundo. Esta jornada de movilización mundial aglutinará la respuesta solidaria de los pueblos con la Patria de Simón Bolívar. Venezuela no está sola. Hoy honramos al bravo pueblo venezolano en su lucha por la paz, el diálogo y su defensa de la dignidad y la soberanía nacional. Mahatma Gandhi dijo “no hay caminos a la paz. La paz es el camino” y el Ché Guevara, con su ejemplo de humanidad, afirmó “la solidaridad es la ternura de los pueblos”. Frente a la amenaza imperial y el guerrerismo, digamos hoy con el gigante Pablo Neruda, nuestra bandera y nuestra victoria será la paz. Paz para que Venezuela siga alumbrando el futuro. 2017 EUROPE DAY reception has enjoyed a massive participation and the launch of new partnerships for European Council on Tourism and Trade with DALI HAUTE PARFUMERIE. The reception was attended by over 1000 people from including prominent guests such as government representatives, diplomatic corps in Bucharest, business leaders, academia, and the media. The celebration started with the Europe anthem “Ode to Joy”. H.E. Professor Dr. Anton Caragea , the Head of ECTT/ Ambassador welcomed the attendees with a brief speech followed by European Tourism Academy Director , Academician Mircea Constantinescu. Professor Dr. Anton Caragea , the Head of ECTT/ Ambassador welcomes Korean delegation to EUROPE DAY festivities. EUROPEAN COUNCIL ON TOURISM AND TRADE(ECTT ) and European Tourism Academy , in cooperation with its partners would like to thank all the sponsors and European embassies by giving a great contribution to make Europe Day Reception as a memorable celebration of Europe and ECTT accomplishments. On the fringes of the celebrations and reception was launched the BEST OF EUROPE/BEST OF THE WORLD programme promoting the best products and lifestyle goods from across Europe and the world. The first company to be enrolled in the product promotion and universal recognition of value was COFINLUXE and DALI HAUTE PERFUMERIE, the creator of WORLD FAVORITE PERFUME for 2017. Others followed suit like: wine and champagne and sparkling wine producers registered in the fallowing days (European Diplomatic Wine`s partners like HOUSE OF PANCIU who unveiled for you the best European sparkling wines and HOUSE OF WINES COTNARI). EUROPE at 60! A GOOD YEAR TO CELEBRATE! 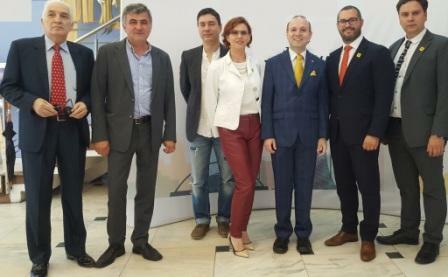 The European Council on Tourism and Trade had hosted the formal reception at European Tourism Academy Headquarters on May 9 from 6:30pm to 10:30pm. Invitees lists included ministers, members of Parliament, justices, senior officials, members of the diplomatic crop, representatives of international and regional organizations and of the civil society, media, development partners and representatives of the private sector. Kazakhstan is preparing to hold early elections on 26 of April 2015, with threecontenders competing for the country top post: incumbent President Nursultan Nazarbayev, the challenger from the Communist People’s Party- Turgun Syzdykov and self-nominee Abelgazi Kusainov. In the preparation of the 2015 election, the country top watch dog-Central Electoral Commission announced that more than 1.000 international observers will be accredited to monitor the elections and more than 10.000 national observers will also control the polling process. The European Council on International Relations had decided to monitor the electoral process developed in Kazakhstan, on the occasion of April 26, 2015 snap presidential election. On 20th of April 2015, the preliminary, pre-election report on monitoring the legislative framework and the preparation for the elections, to be held in Kazakhstan, where read open by the team of experts from European Council on International Relations. The conclusions of the group of experts comprised of parliamentarians lead by Senators Marcel Dumitru Bujor, Ionel Agrigoroaei, Constantin Popa, academicians lead by Professor Dr. Mircea Constantinescu and electoral experts team lead by Mr. Gheorghe Cealfa where received by Professor Dr. Anton Caragea-President of European Council on International Relations. Professor Dr. Anton Caragea accepted the findings of the report and agreed with his recommendation: that a team of experts and parliamentarians from European Council on International Relations will follow the Election Day process countrywide, and will supervise the Election Day activities, including voting, counting, and tabulation of results in the Republic of Kazakhstan presidential elections. Kazakhstan has fully responded by respecting his democratic commitments and the highest standard of electoral competitions and we hope hat the 26 April-Election Day will be another proof of the democratic standards upholded by Kazakhstan. We will be there to monitor on the site evolutions, stated Professor Anton Caragea, EUCIR President. Europe is determined to promote the values of fairness, open society, free and fair elections and democratic developments by using the example of countries with a positive track record on democratic evolutions like Kazakhstan. To this aim it was published a new version of the website: DEMOCRATIC KAZAKHSTAN. PRESIDENTIAL ELECTIONS 2015. In 2011, with the support of European organizations and European Council on International Relations, a first version of the site was dedicated to the PRESIDENTIAL ELECTIONS 2011, in support of democratic development of Kazakhstan. The informational site is destined to offer to political analysis, experts, electoral experts a valid insight in the democratic process taking hold in Kazakhstan. In this moment no real and trust wordy organization is involved in presenting the valid analysis on the strong democratic process created by Kazakhstan and the information available is on the junk category, considers on a rightful base the Kazakh News Agency-inform.kz. This lack of serious information’s must be addressed with new and perfect directed info. 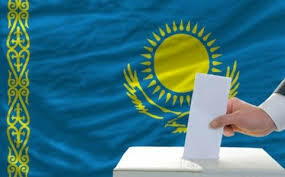 The http://kazakhstan-elections.webs.com/apps/blog/ accumulates several services including: international ad national news, discussion, videos and related information’s. On April 20, 2015 the website will unveil the first international pre-election monitoring report on Kazakhstan Presidential Elections 2015 and the website will also offer to the readers a final report and analysis on Kazakhstan Presidential Election 2015. On March 3rd 2015, under the high patronage of European Council on International Relations, European Council on Tourism and Trade and Institute of International Relations and Economic Cooperation, the Parliament of Romania and representatives of European Parliament hosted the international conference: ASSEMBLY OF PEOPLE OF KAZAKHSTAN-A UNIVERSAL DEMOCRATIC MODEL. The academic conference was subscribed to the traditional strategic friendship that is uniting Europe and Kazakhstan and was destined to highlight to European and international audience the fundamental role of an institution unique in the world and reflecting Kazakhstan specificity: ASSEMBLY OF PEOPLE OF KAZAKHSTAN. This institution of paramount importance was established in 1995, according to a decision of President Nursultan Nazarbayev and has the role of allowing all national, cultural and religious minorities on the territory of Kazakhstan to partake together with the Kazakh majority in building a society model, in selecting cultural politics and in building an open and inclusive society integrating all citizens. Today after 20 years of activity, the ASSEMBLY OF PEOPLE OF KAZAKHSTAN had become a model for all the states of the world, a model of resolving minority’s problems and democratic people’s involvement. In the framework of the conference, hosted by Parliament, the leadership of the parliament had outlined messages of support for the Europan-Kazakhstan relations, for the profusely democratic character of ASSEMBLY OF PEOPLE OF KAZAKHSTAN and messages of admiration for the national and democratic construction achieved by the exertions of Kazakhstan President Nursultan Nazarbayev. Together with the leaders of the Parliament, on the venue of the conference where present also 23 diplomatic representatives headed by the leader of diplomatic activity of diplomatic corps-Iraq Ambassador Omer Berzinji and presented reports for the conference personalities such as: Senate Leader-Florin Constantinescu-Chairman of the Energy, Industry and Transport Committee of the Parliament, Professor Dr. Anton Caragea-President General Director of Institute of International Relations and Economic Cooperation, Senator Marcel Dumitru Bujor-President of the Committee for Romanians Abroad and International Relations, Deputy Costel Alexe-Chairman of the Romania-Kazakhstan Parliamentary Friendship Group, UNESCO Committee-Senator Constantin Popa, senators Ionel Agrigoroaei and Senator Ciprian Rogojan from Defence Committee and European Affairs Committee. The Conference dedicated to the role of parliament and the presentation of ASSEMBLY OF PEOPLE OF KAZAKHSTAN had also benefited from the presence of a consistent delegation from Kazakhstan Parliament lead by Senators Serik Akylbai, Bekturganov Serik and deputy Tulesh Kenzhin who outlined for the attendees the mechanism and the signification of a unique institution in the world: ASSEMBLY OF PEOPLE OF KAZAKHSTAN. Concluding the conference, the Kazakhstan parliamentary group received the special MEDAL OF HONOR OF THE PARLIAMENT in sigh of lofty appreciation of the importance of the inter-parliamentary relations between Europe and Kazakhstan. The Conference of Parliament has attracted representatives from 23 countries. We address all our gratitude for their attendence that was a sign of respect towards the institution of Parliament, a perfect way to show commitment to European foreign policy and a diplomatic way to present appreciation to Kazakhstan delegation. Your presence was noted as a perfect fulfillment of your mission as a friend of Europe. Shearing a moment of laughter. The relations between Europe and Africa were rapidly evolving in a positive direction after the visit of an important european delegation in the Republic of Zimbabwe. The visit made between 29 May-7 June 2014 by an European delegation headed by H.E. Professor Dr. Anton Caragea, President of European Council on International Relations was destined to restart the bilateral relation between Europe and the Republic of Zimbabwe and the southern region of Africa, a region in full economic development and with a long tradition of partnership with our country. 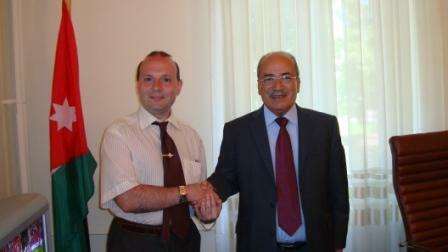 During the visit Professor Dr. Anton Caragea was welcomed by H.E. President of Republic of Zimbabwe-Robert Gabriel Mugabe who stated that: is exuding with love and gratitude for the visit of Professor Dr. Anton Caragea. President Robert Mugabe express his gratitude for Professor Dr. Anton Caragea continuous support in promoting Zimbabwe integration in international tourism arena and stated than: when others where plotting to punish us you think at rewarding us and make us friends. From the profundity of our heart: Tank you Professor ! Professor Dr. Anton Caragea at his turn praised president Mugabe stating that: the world did not forget the ten years spent in the dungeons of the colonial rule, the world did not forget the 20 years of revolutionary activity at the risk of the life and personal peace, spent in the opposition to the absurd regime of apartheid and segregation of Old time Rhodesia. We will never forget that 35 years ago from Harare you have called all nations of Africa to wake up from the long colonial sleep to a new and rich life of fulfillment`s. Your name is and will be forever inscribed for me and for all the honest people of the world along the names of the fathers of free Africa:Kwame Nkrumah, Julius Nyerere, Jomo Kenyatta etc. as a giant of liberation and freedom fight in Africa and the world. Other meeting where held by H.E. 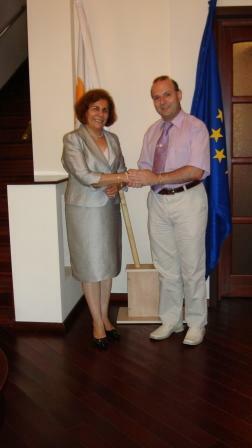 Professor Dr. Anton Caragea with Hon. J.T.R Majuru- Vice-President of Republic of Zimbabwe, S.K.Moyo-Senior Minister (Prime Minister) of Zimbabwe, Hon. N. Goche-Minister of Foreign Affairs and Minister of Tourism Walter Mzembi etc. During the discussion, foreign policy cooperation, opening of honorary consulates and economic cooperation councils as well as economic and investment opportunities where tabled offering opportunity for European countries to take part in the business boom and bonanza of southern region of Africa and specially the Republic of Zimbabwe buoyant economic environment. The European delegation enjoyed a sophisticated cultural program with visit to the History Museum of Harare, National Heroes Acre and to the wonderful UNESCO heritage site of Great Zimbabwe-the largest African palatial complex dating from XII century and covering 700 hectares and a chance to discover the world greatest cascade: Victoria waterfall. In sign of honor Professor Dr. Anton Caragea occupied the Winston Churchill apartment in the famous Victorian hotel of Victoria Falls. The high level visit, the first after a 25 year hiatus in bilateral relation offered to the parties the opportunity to table concrete cultural, tourism and cooperation projects and to highlight the bilateral support for the development of the social and political cooperation. The Republic of Zimbabwe becomes now the main political and strategic partner in the region of southern Africa, offering innumerable opportunities for developing friendly ties. Victoria Falls-the world largest cascade. ECOLOGICAL CIVILIZATION: THE GOAL OF MANKIND IN XXI CENTURY. In the last period of time, a new concept had arise in the framework of international policy and of environmental action: the idea of an ecological civilization, understood as a complex economic, cultural and social structure that is insuring the future of global and sustainable development, in accordance with the laws and necessities of nature. In today world the emphasis must be on building a new society structure, based on the values of ecological civilization. Professor Dr. Anton Caragea presenting his views on a XXI century based on values of ecological civilization. From a historical point of view, we can appreciate that we are leaving a turning point in the development of human society. This moment can be only compared with the end of medieval age and the beginning of the industrial and modern period of human society, a period that involved a profound transformation in society, politics and economy. Today we are living a similar period of world crisis and transformation. This is involving a tremendous economic crisis, spaninng now for more that six years, a crisis that it will continue for at least five to ten more years and is re-shaping economic climate, business environment and is creating poverty, inflation and promoting striking inequality and exploitation all around the world. Present day economic crisis, is proving that the XVII century economic model of capitalist and profit based economy is exhausted and is not creating wealth and prosperity but poverty, underdevelopment and crisis on a world scale . The crisis that we are experience now is deeper than just the economic factor it is also rapidly becoming an environmental disaster at planetary scale. The economic and civilization model in use today in the western world, becomes unsustainable: the resources are depleting in a rhythm unknown in history, the pollution is exacerbating and the economic cost of the environmental changes and climate changes is unfathomable. Confronted by the failure of today economic system (based on inequality, quagmire poverty, the abnormal cost of consumer based society etc.) and the natural patrimony destruction by exploitation and pollution, all factors converge to make this model un-economic, un-ethical and un-sustainable. The consumerist based society and vision of a future, in which we can spend and destroy everything for the sake of profit, is based on a failed policy and vision that is undermining the future of human society. The economic crisis has broken down from the rostrum of philosophical ideas the concept of eternal development and never ending consumerism. The ecological crisis is spelling clearly the end of another dream (of inexhaustibility of natural resources and non-value of nature) and is emphasizing the fact that: the collapse of the present civilization model is putting under question the future of human specie. I must also emphasize that by today the ecological crisis is rapidly becoming an emergency in tackling, because of the high risk involved in the environmental damage and the resources exhausting. Heydar Aliyev Center: the venue for a new manifesto for XXI century. Solving this issues: safeguarding the resources and the environment becomes economically inefficient and unsustainable for today civilization model based solely on profit as supreme value. Converting human society towards an ecological civilization is therefore logical and necessary in order to adapt the XXI century society to the challenges and transformations of our time. The philosophical solutions of XVII century are no longer feasible in today economic and political climate. Ecological civilization: a national goal or an international target? More and more country’s are starting adopting and pioneering the concept of Ecological civilization (in 2007 Communist Party of China leader –Hu Jintao even press for adopting ecological civilization as a national objective in Peoples Republic of China and present day President Xi Jinping ask United Nations to register this concept along sustainable development ) we must draw a fine line between the implementation of the concept of Ecological Civilization (E.C) in the national economy and development plans and adopting as an international target. Already United Nations Development Program adopted Chinese report on China Sustainable Development Report 2013 – the road to ecological civilization: the next decade, as an UNDP international document and started elaborating future policies on this document. From this first steps is starting the first necessity in elaborating and implementing the concept of Ecological Civilization. To this extent we can use the road map, already drafted for Millennium Development Goals and start incorporating the basic principles of ecological civilization into national documents in the same time as elaborating them as international documents. We must clearly state that: all thou the national actor’s role in implementing Ecological civilization on a world scale is prominent, solely promoting the inclusion into national agenda will not suffice. Only accepting Ecological Civilization as a long term, mandatory goal of the international community can offer chances to success in implementing this society model on a world scale. Representatives from 65 countries attended the manifesto launch. The role of diplomacy in promoting ecological civilization concept. The promotion and international presentation of the ecological civilization paradigm is a task that can be entrusted to international diplomacy. In order to rapidly foster the dialogue and the acceptance of the concept of ecological civilization (E.C.) this must be amalgamated as an index (similar to human development index) in ranking countries international stature and success. All the countries must be evaluated in their contribution in implementing the E.C. model in their economy and society and also in appraising their role in attaining this aim on international level. Ecological Civilization must be introduced as a part of international law by becoming part of the international treaty system, being a starting point for regional, trans-national and global and continental cooperation ( and also used in bilateral agreements between national and international company, NGO and cultural entities etc.-on the framework of cooperation carved for Millennium Development Goals ). In 1997, United States proposed a Forum of Democracy, in promoting the values of indirect democracy world wide. This initiative has failed in the mean time as indirect democracy is considered inadequate by more and more countries, but the idea must not be forfeit. A similar Forum for Ecological Civilization, used by the nations and institution that understand their global responsibility, can be used to foster connection and promote the practical measures to achieve the goal of ecological civilization. The international assistance budgets must be converted in budgets for ecological civilization development. Instead of being awarded and placed for political agenda issues, on debatable criteria, there must be used solely for projects that are in conformity with sustainable development criteria and agenda. The contribution of all nations to international peace and security and development must be based on the contribution to promote an ecological friendly civilization. This also must be based on the contribution of United Nation and their relief and specialized agencies and also of economic world entities (such International Monetary Fund and World Bank) in implementing ecological civilization specific agendas. Initiating a global and world wide level debate it is another urgency . This debate will be centred on economical agents and on the necessity of promoting the agenda of ecological civilization as the only rational and economic sound investment, based on concepts like: green economy, sustainable profit and updating economical mechanisms to the provocation of XXI century environmental cost. Building an ecological civilization involves a change in the economic society matrix that has proven to be unreliable and inefficient and unproductive. Today economic matrix ( that is disregarding the long term impact on environment) has proven to be inefficient, cost-ineffective and promoting under-development on a world level and promoting inequity and inequality between nations, regions and economical classes , creating un-sound disparities and provoking havoc in economy and world environment. This situation must mark clearly that the ecological civilization is not a trend or an intellectual fashion, but must evolve in being a society model responsive to the necessities of XXI century. An article expressing the analysis of the policies implemented by Japanese Prime Minister-Shinzo Abe in the last year of government and is presenting the main figures of what is called today as abenomics. Just two years ago the key words about Japan where summarized in the expression: lost decades. After 1990, Japan seems to be fallen in along period marked by stagnation and by natural disasters such as Kobe earthquake and more recent Fukushima tsunami. On economic field, the country that once towered over the region as an international symbol of economic growth in the sixties and seventies, was struggling now with hipper-inflation, reduced economic competitiveness and the unfair competition of cheep and low quality products of China. The man who succeeded in pulling up the country from tittering on the brink of the abyss: Shinzo Abe had managed also to enrich the economic vocabulary with a new term: abenomics (a strange mingling of his name-Abe and economics). The economic policy that allowed a new Japanese economic miracle to appear was created by a seasoned and sophisticated mixture of direct state investment in economy and indirect state buying of Japanese National Bank bonds, a move that allowed for the credit to be cheaper and more relaxed and for interest rates to decrease. This infusion of capital was not planed as a sole engine for economic growth but was planed to aid and support private investment as the key factor in economic development. State sponsored investment is just an auxiliary, a support and confidence booster in economic growth and an ingredient to further increase private confidence in economy. Another key element of the economic stimulus plan is offered by the increase in competitiveness of the Japanese products by means of financial support, including currency devaluation that is insuring that national products are cheaper and more attractive and by fiscally backing increases in competitiveness. Finally, what is making Japanese prime minister plan different is the accent on fighting the inflation and keeping it under control. As a golden rule, any stimulus package must bear the responsibility of an increase in inflation. Is not the case with Japan where abenomics is creating a serious anti-inflation package with controlling the spike in wages, strict taxation and export oriented growth rather that stimulus of internal consumption. All are specific measures that are making abenomics a balanced experience between growth and inflation, competitiveness and exports etc. Finally, another trait of the abenomics that deserves our attention is the social management plan. The pension system, social security and health systems are all regarded as pivots of the economic growth but also of national satisfaction. Proceeding by this path the Abe government is not falling down the easy road of electoral charity, as done in United States or Europe, but is opting for investing the economic surplus in indirect social expenses that are enriching life quality without inflation as a side effect. Once the first results of abenomics are becoming visible. the plan enjoyed a star status, many economists are predicting a role model for these economic policies, famous economic thinkers as Joseph Stiglitz, risking the prophecy that abenomics will be a successful blue print for world economy. The general interest was also attracted by the elevation of economic situation at the level of national security agenda. It is in this decision a message of seriousness and maximum attention that Shinzo Abe government is portraying as a supplementary strong point of the Japanese economy in front of the national and international private investors. The status of national economy becomes as such an element of national security and your investments are sure, is the subliminal message that Japan is offering to the investment market as a new powerful arguments in his favour. Undoubtedly, the news of the hay days of Japanese economy is a good news for world economy already deeply endangered by the collapse of Chinese economy. 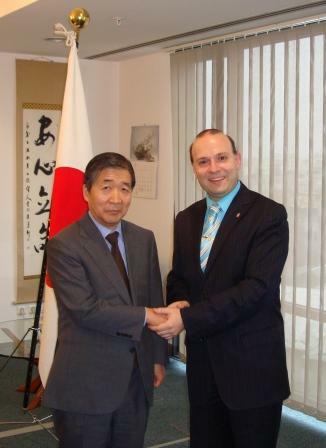 The abenomics can be only used by the country which already has build a powerful economic apparatus, with a developed industrial mechanism like European Union members states or American economy, as we are confronted with an economic experience that is focused on refining the economic decisions in preventing inflation and insuring a healthy and stable economic development after the current world economic crisis. As such the abenomics model must be understood and copied by the world economic powers in order to allow a solution to emerge out of this world economic crisis. By this alone the abenomics can be the most valuable contribution that Japan is presenting in re-launching the world economy development and by extracting the world out of this auto-regenerating crisis. Today, thanks to abenomics, Japan can rest assured as his role model in world economic recovery is guaranteed. On 10 June, 2013 a friendly and cooperation meeting between Prof. Dr. Anton Caragea, President of European Council on International Relations and H.E. Abdulrahman Al Rassi, Ambassador of Kingdom of Saudi Arabia had taken place. Prof. Dr. Anton Caragea expressed his amicable fillings and friendly interest towards the recent evolutions in Kingdom of Saudi Arabia. The Kingdom is playing an instrumental role in promoting cultural and economic development in the Middle East area. Also Europe is witnessing with sympathy and interest the latest evolution from Saudi Arabia, including the government measures for consolidating the economic development and creating a diversified economy and the decision to foster social inclusion and cultural development in the Kingdom. Europe is, and it will always be, ready to build a special and stable relation with the Kingdom of Saudi Arabia, a relation based on the community of interests in the economic, politic and cultural areas, concluded Professor Dr. Anton Caragea. H.E. Ambassador Abdulrahman Al Rassi express his appreciation for the encouragements received and for the amicable atmosphere registered amongst Europe n people towards the culture and civilization of Saudi Arabia. Between the two nations there is an ample desire for information and cooperation and to amplify the bilateral relation stated Ambassador Abdulrahman Al Rassi. On this solid foundation we can consider an extension of the cultural dimension of bilateral relation and in building new bridges of dialogue between Europe and Kingdom of Saudi Arabia. The parties had appreciated that between Europe and Kingdom of Saudi Arabia there are large area of common interests, designed to forge a good understanding between the two nations. An increase in the presence of Kingdom of Saudi Arabia related news in Europe n mass media and informational market and a better reflection of his specific culture to Europe n public and the presence of an academic message of support where also tabled at the meeting. The dialogue had continued on concrete aspects and analyses of economic, political and cultural bilateral relations and on ways of fostering this dialogue on to the future. The discussion led the foundations for continuing the dialogue and fostering the relations between Europe and Kingdom of Saudi Arabia. Professor dr. Anton Caragea, President of European Council on International Relations( EUCIR ) had invited a delegation of ambassadors to attended the spring edition of the DISCOVER EUROPE program by visiting Bucovina. Bucovina is one of the most scenic spots of Europe, encompassing UNESCO cultural heritage sites such as: Voronet, Sucevita and Dragomirna and also geographical wonders that are transforming Bucovina in the land of magic, a focal point in world tourism top. Under the mandate of the recently elected President of Suceava County: Mr. Catalin Nechifor , Bucovina has being transformed in a prime interest area for investors and business community, becoming a rapid developing economic attraction, ambassadors invited to take part in the delegation, having the chance for first hand contact with local realities and rapid developing areas in Europe . Being invited to attend the regular trips of DISCOVER EUROPE program and visiting the natural and cultural scenic spots of Europe is a reward traditionally awarded to ambassadors that had successfully fulfilled their offices in the last six months, outstandingly promoting the bilateral relations with Europe . In the last years EUCIR had organized ambassadors trip in gorgeous areas such as: Maramures County, Apuseni Mountain, Danube Delta and Hateg region and today we have felt it is the time to promote the fusion of art, culture and natural beauties but also the culinary specialities of Bucovina stated Professor dr. Anton Caragea, President of European Council on International Relations( EUCIR). The program of ambassadors delegation headed by Professor dr. Anton Caragea was carved to include discussions on high level with authorities of Suceava county, with President of the Suceava Council: Mr. Catalin Nechifor, with the Rector Office of Suceava University( the university staff outlined the project of anew technologic campus , an investment to exceed 200 million euro) ,and discussion with leading business community members under the banner of Chamber of Commerce and Industry of Suceava. After the productive and intense business discussion held at local level the ambassadors delegation had also enjoyed an exceptional cultural program designed with the support of president of the County Council: Mr. Catalin Nechifor. The visit had encompassed trips to UNESCO heritage monasteries of Voronet (world famous for his outside wall paintings and for the unique Voronet blue colour), Sucevita and Dragomirna, trips to Horse Training Center where ambassadors enjoyed a practical riding lesson and Hunting Center, where ambassadors where informed about the rules and regulation for organizing hunting’s in Europe and also could taste unique cuisine of the region. The tight schedule had included also stops to Ion Irimescu Sculpture Museum, where the fabulous Irimescu sculptures with prices ranging from 1 to 10 million euro where scrupulously admired by the ambassadors, a visit to Vatra Dornei and the world famous mineral waters of the area, where ambassadors also enjoyed a meal of trout and pheasants and an instructive working visit to Black Pottery Center form Marginea Village, where they could admire the famous craftsmen of Bucovina and learn from source how to produce the unique ceramic of the region with unchanged technologic process from the last 5.000 years. Professor dr. Anton Caragea, AMBASSADOR FOR WORLD NATURAL PROTECTED AREAS had included in the ambassadors visit some of the natural reservations from Suceava County in order to highlight the importance of this area to the local economy. The program also included a special culinary show in every night that had included deer stake with wild berry jam, rabbit and pheasants and more than 50 varieties of local cheese and famous Bucovina pastry, the richness of the food illustrating Bucovina as a fusion zone for oriental cuisine and for western culinary experiences. The ambassadors present to BUCOVINA: LAND OF MIRACLES trip expressed their gratitude for the special trip to the land of magic: Bucovina on the spot visit, that presented before their eyes unique cultural treasures , unique taste of culinary magic and more important they have the privilege to encounter the real miracle of the area: friendly and warm peoples of Bucovina. Ambassador group visiting the famous Baciu House- the headquarters of delicious cuisine of Bucovina. Ambassadors get courage for a Bucovina type dance in general joy. The beauty of Bucovina horses. Touring the Palaces of Vatra Dornei. The famous pheasants of Bucovina. Dialogue at the Camber of Commerce and Industry of Suceava county. Visiting the mineral water gushing station in Bucovina . Health from water. On 20-th of July 2012 the working meeting between a delegation of European Council on International Relations, lead by professor dr. Anton Caragea and a delegation from Socialist Republic of Vietnam, lead by Ambassador Vuong Thua Phong, Vice-Chairman of Commission for External Relations of Communist Party of Vietnam had taken place. Opening the working meeting, Professor dr. Anton Caragea had extended his gratitude towards the Embassy of Socialist Republic of Vietnam for hosting and organizing this working dialogue and bid official welcome into our country to Vietnamese delegation. Professor dr. Anton Caragea had emphasized, in his speech, the European side openness towards friendly dialogue, consistent and productive towards Vietnam, expressing his interest in expanding bilateral economic exchanges and fostering political and cultural dialogue between the two countries. The visit of a Vietnamese delegation at the highest level is for us a source of excitement, furthermore as Europe is seeking to re-ignite the long economic and political cooperation tradition towards Vietnam and is considering Vietnam as a privileged partner in this world region, stated prof.Anton Caragea . Answering to comments made by Professor dr. Anton Caragea, H.E. Ambassador Vuong Thua Phong, underlined that Vietnam is also interested in political, cultural and economic cooperation with Europe and the encouragement received during his visit are extremely important in re-launching the bilateral dialogue. The meeting had continued with a large area of issues raised in open dialogue between Professor Dr. Anton Caragea and Ambassador Vuong Thua Phong, Vice-Chairman of Commission for External Relations. The issues varied from main developments in Europe and South-East Asia and the main humanity problems up to date. The long and open dialogue, full of substance, was considered as extremely useful for the parties and the desire to continue this dialogue in the next period was underlined by the parties. 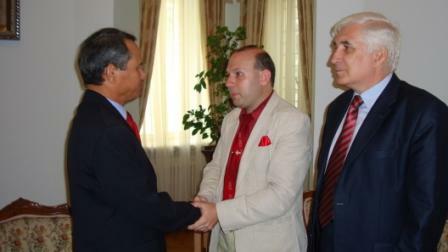 On 4 of July 2012 the taking office protocol and presentation meeting between Prof. Dr. Anton Caragea, President of European Council on International Relations and H.E. Kalliopi Avraam, Ambassador of Republic of Cyprus had taken place. Prof.dr.Anton Caragea express his heart felted congratulation on the occasion of beginning of mandate of Mrs. Kalliopi Avraam , appreciating that between Europe and Cyprus there is a long history of cultural, economic and political cooperation and a large area of common interests , designed to forge a good understanding between the two nations . The Europe- Cyprus relationship has the ability to become an example of building an economic and cultural exchange area between East Mediterranean region and Europe. Now it is an auspicious moment for reconstructing and rebuilding the framework of dialogue and friendship between Europe and Cyprus, as the level of bilateral expectations is greater and the political and economic will for this favorable expansion of activities is clearly marked. H.E. Kalliopi Avraam had expressed here appreciation for the encouragement`s offered by prof.dr.Anton Caragea and had stated that the vision of a economic, politic and cultural special relationship between Cyprus and Europe is a common shared vision. This year is especially important for the bilateral relation as Cyprus is having European Union Chairmanship and is interesting in searching ways of cooperating with Black Sea region and supporting the Republic of Moldova aspiration for EU integration. The main topics had concentrated on increasing the bilateral trade volume, expanding tourist liaisons and fully exploiting Cyprus special tourist potential and organizing information trip for European mass media and European tourism enterprises interested in being present on Cyprus tourist market. The amicable dialogue concentrated also on the possibility of organizing academic and political events destined to mark Cyprus mandate as European Union President, hosting a bilateral Business and Trade Forum and a book exhibition about Cyprus. The dialogue led the foundations of a successful diplomatic mandate and fostering the relations between Europeand Cyprus and constitutes a promise for re-launching a European diplomatic action towards Cyprus and supporting Cyprus to have a successful mandate at EU Presidency. On 19 of June 2012 the taking office protocol and presentation meeting between Prof. Dr. Anton Caragea, President of European Council on International Relations and H.E. Qabba`ah Munther , Ambassador of Hashemite Kingdom of Jordan had taken place. Prof.dr.Anton Caragea express his heart felted congratulation on the occasion of beginning of mandate of H.E. Qabba`ah Munther , appreciating that between Europe and Jordan there is a long history of economic and political cooperation and a large area of common interests, including an important Europe-Jordanian community , designed to forge a good understanding between the two nations . The Europe- Jordan relationship has the ability to become an example of building an economic and cultural exchange area between Europe and Middle East. Now it is an auspicious moment for reconstructing and rebuilding this framework of dialogue and friendship between Europe and Jordan stated professor dr. Anton Caragea, as the level of bilateral expectations is greater and the political and economic will for this favorable expansion of activities is clearly marked. H.E. Qabba`ah Munther had expressed here appreciation for the encouragement`s offered by prof.dr.Anton Caragea and had stated that the vision of a economic, politic and cultural special relationship between Europe and Jordan is a common shared vision. Also ambassador Qabba`ah Munther had appreciated the clear progresses made by Europe in the last 17 years since his previous diplomatic appointment to Europe. The main topics had concentrated on increasing the bilateral trade volume, expanding tourist liaisons and fully exploiting Jordan special tourist potential and organizing information trip for European press and tour operators interested in being present on Jordanian tourist market, cooperating in presenting Jordan leisure real estate opportunities and re-launching the cultural exchanges. The dialogue led the foundations of a successful diplomatic mandate and fostering the relations between Europe and Jordan and is constituting a promise for re-launching a European diplomatic action towards Jordan in the nearest future.